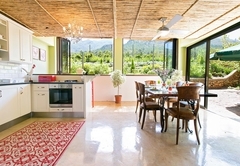 Heuwelsig Cottages is a 4 star graded property offering Franschhoek accommodation for tourists and visitors of the Cape Winelands. 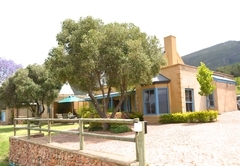 Heuwelsig Cottages is situated on a working wine farm, surrounded by lush vineyard, orchards and scenic landscapes, just 5km from the well known village of Franschhoek, about an hours drive from Cape Town. 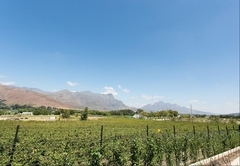 The newly renovated cottages offer a tranquil retreat from the hustle and bustle of city life, for couples and families, visiting this scenic part of the Cape Winelands. 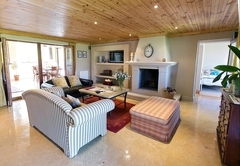 Heuwelsig Cottages comprises of two luxurious self catering units / cottages, each with en-suite bathrooms, individually decorated with the finest white linen, fluffy white towels, underfloor heating, satellite TV, private entrance with splendid views overlooking the Franschhoek Valley and mountains. 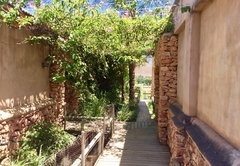 The Family Cottage provides accommodation for a family of four (shared bathroom) and offers panoramic views of the valley and vineyard, with private courtyard in the back. 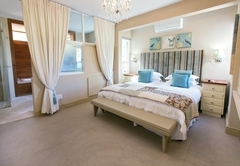 The room is spacious and consists of two single beds and a king size bed, with full en-suite bathroom, under floor heating and flat screen TV with DStv. 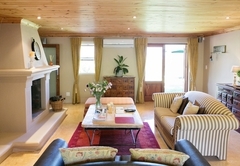 The Family Cottage provides a feeling of a secure, comfortable and spacious environment, offering an air-con, lounge with fire place, kitchen / dining area, equipped with all glassware, crockery, cutlery and electrical equipment. 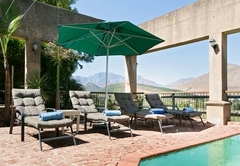 Portable braai facilities available outside, private entrance and safe parking on the premises. 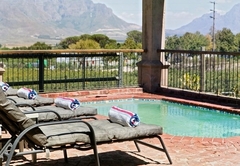 The Mountain Cottage is a charming and stylish cottage, providing accommodation for two adults only and offers spectacular view of the mountains and peach orchards, with private courtyard in the back. 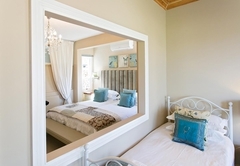 The room consists of a king size bed that can be converted into two single beds, if required and en-suite bathroom (shower only), under floor heating and flat screen TV with DStv. 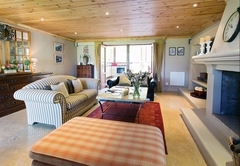 The Mountain Cottage provides a feeling of a secure, comfortable and cozy environment, offering a sitting room with built-in barbeque / fire place facilities, kitchen equipped with all glassware, crockery, cutlery and electrical equipment. Portable barbeque facilities, is also available outside, private entrance and safe parking on the premises. 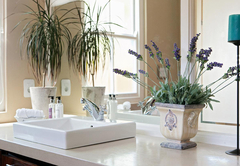 All plots are equipped with electrical points, water, barbeque, with wood and our new ablution provides hot showers, flush toilets, mirrors with plug point for hairdryers and wash up for dishes. Heuwelsig offers 3 auto home camping plots, plot 1 & 2 are the same size and plot 3 are a bit bigger and can accommodate 2 auto homes or one big one. To cool down in the hot summer days the property provides a sparkling fenced splash pool to simply just relax at and watch the world go by while lounging on the deck chairs. 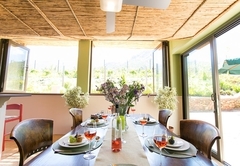 Our limited number of guests can be assured of an unforgettable stay, with peaceful and elegant surroundings, spectacular view of sweeping landscapes, mountains and vineyards and the enjoyment of the full flavor of Franschhoek country living. 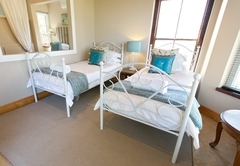 Expect a hearty welcome from the staff at Heuwelsig Cottages, which provides a feeling of a secure, modern and relaxing atmosphere. 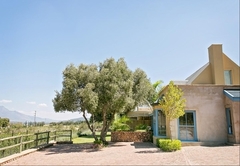 Offering spectacular views of the mountains and peach orchards, with private courtyard in the back, en-suite bathroom, sitting room, TV with DSTV, BBQ facilities, fireplace, fully equipped kitchen, private entrance and secure parking. 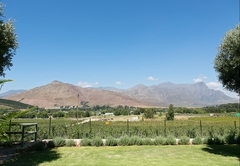 Offering panoramic views of the valley and vineyard, with private courtyard, spacious room, TV with DSTV, lounge with fireplace, fully-equipped kitchen, dining area, BBQ facilities, private entrance and secure parking. 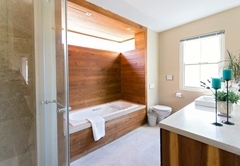 Auto Home Plot / Campsite are equipped with electrical points, water, barbeque, with wood and our new ablution provides hot showers, flushed toilets and a wash up for dishes. No Pets, No Ground tent and maximum stay, 7 days. 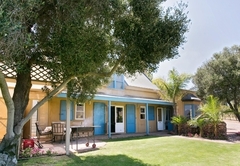 Response timeHeuwelsig Cottages typically responds to requests in 5-10 minutes. 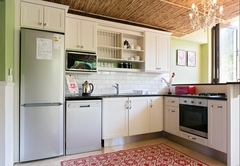 Heuwelsig Cottages, does not have a 24 hour reception service. 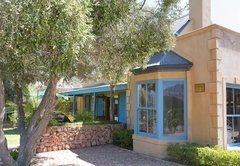 Reception office closes at 16h00 Monday to Friday. Please inform the manager on duty if you will be arriving after 16h00 on your day of arrival to ensure that you receive assistance with checking yourself in, with all the necessary information required.